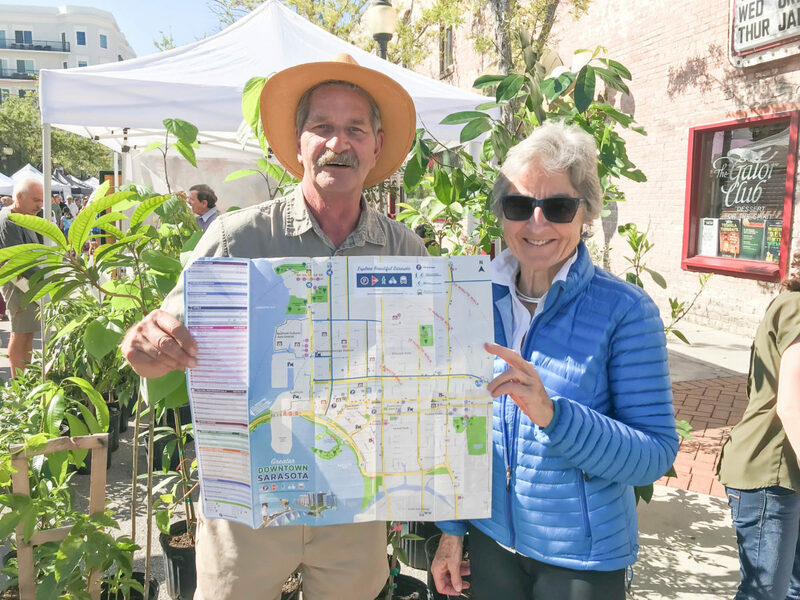 This weekend marks the debut of the new Greater Downtown Sarasota Mobility Map, created by local Rosemary District resident Maria Haber, and recently gifted to the Sarasota Farmers Market as part of our new Market Green Initiative. The Mobility Map was created for wayfinding – designed to show that most of Sarasota’s major attractions can be reached without a car – within 20 minutes from the heart of downtown. Showcasing the Sarasota Farmers Market in the heart of the city, it also displays public parking garages and lots, buses, major attractions, local parks, theatres and performance halls, grocery stores and supermarkets, colleges and schools, and government buildings. The Mobility Map encourages readers to park their cars and explore what Sarasota has to offer by walking, biking, or using public transportation. Concentric circles on the map indicate the length of time it will take to walk to an attraction. The map also displays bike lines for bicycle users. Map creator, Maria Haber, a resident of the Rosemary District in Sarasota and a part-time resident of Washington, DC, created the map to help foster a more sustainable, pedestrian-friendly community. 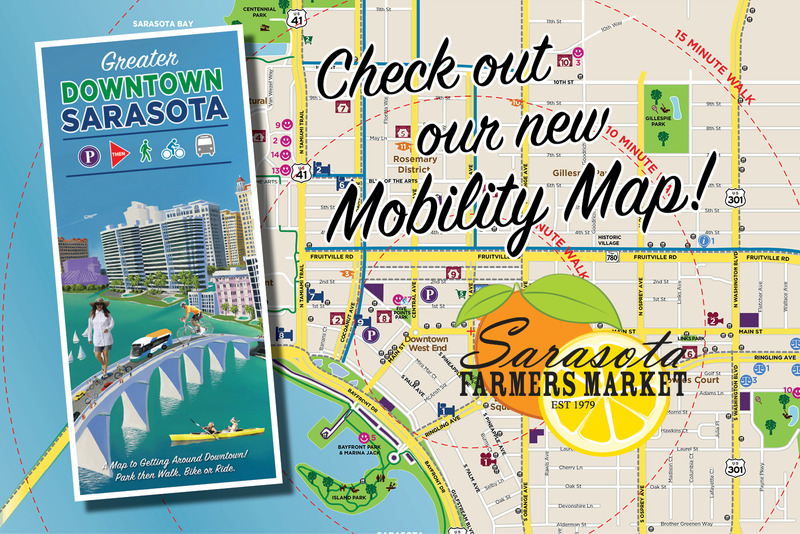 The Mobility Map will be available beginning on Saturday June 2 at the Sarasota Farmers Market Information Booth. Businesses and organizations can request copies of the Greater Downtown Sarasota Mobility Map for distribution by contacting Sarasota Farmers Market Executive Director, Phil Pagano, at 941-225-9256 – or manager@sarasotafarmersmarket.org.